Due to be published by Palgrave Macmillan in September 2020 to mark the Battle’s 80th anniversary, Garry Campion’s third volume is entitled The Battle of Britain in the Modern Age, 1965-2020: The State’s Retreat, and Popular Enchantment. Continuing from his second volume which considers the period 1940-1965, this new book explores the Battle’s historiography, popular culture and heritage during the 55 years following Churchill’s death. Whilst the State in the form of the government and Air Ministry had strongly led the valorisation of the Few until the late 1950s, official interest slowly waned thereafter. Moreover, whilst the Royal Mail had issued a set of stamps to commemorate the Battle’s 25th anniversary in 1965, this was a rather isolated event. The merging of the Air Ministry with the newly-formed Ministry of Defence in the mid-60s also changed the political landscape and reduced opportunities for the RAF to act independently in commemorating the events of 1940. Into the modern age, although the 1969 Battle of Britain movie revived media and commercial interest in the Battle, wider anti-war sentiment engendered by Vietnam, Flower-Power, and students protests more generally, made it an inauspicious time to release the film. Undoubtedly an important and celebrated event in British popular memory, it was inevitable that its significance would fade over time, and younger generations focused on the future, rather than the past. This third volume also considers the history of the Battle from 1965-2020, including revisionist and counterfactual assessments, in addition to novels, of which many have been published. Film, radio and online media are also considered as elements of the Battle's cultural history, as are examples of computer games, and other examples of modern commodification. The reputation of the Few provides one element, with some focus upon their post-war standing in the post-war years, with several former aces, including Sir Douglas Bader, enjoying continuing national fame. Several members of Churchill's Few were also involved in national monuments to remember the Battle and those who had died, including the memorial at Capel le Ferne, and the monument on London's embankment. As the 'architect of victory' in 1940, Sir Hugh Dowding is also considered in light of his continuing importance in more recent history - there have been two biographies published about him in the last decade - and also Sir Keith Park's role as the head of II Group which bore the brunt of the fighting. The reputations of those alleged to have been involved in Dowding and Park's removal in late 1940 are also considered, based on publications since 1965. It was through the efforts of the private sector, especially voluntary groups and individuals, that the heritage of the Battle of Britain developed from the later 1970s. In addition to the Battle of Britain Museum which was later absorbed into the RAF Museum (its foundation and closure in 2016, considered in the book), numerous other sites and museums have been established which reflect aspects of the Battle. Since the 1980s statues, memorials and monuments have also been established, invariably the work of voluntary groups. The Heritage Lottery Fund has also proved vital in assisting with the development of more recent heritage sites connected with the Battle including Bentley Priory, RAF Bawdsey, RAF Kenley, RAF Biggin Hill, and the International Bomber Command Centre memorial near Lincoln, which is significant in remembering RAF bomber aircrew who took part in the Battle of Barges, where attacks on invasion preparations resulted in aircrew losses. These attacks remain largely eclipsed from the Battle's popular history, an aspect explored in the author's second volume. The other aspect of importance has been the contribution of Polish and Czechoslovak pilots and aircrew during the Battle - both fighters and bombers - which has been remembered through a series of permanent or temporary exhibitions at RAF Northolt, the RAF Museum, and the Duxford and Tangmere museums. Airfields as heritage sites are also considered. Fire tender building at former RAF Hawkinge in Kent. Virtually nothing remains of this historic airfield in the front-line during the Battle of Britain, other than the buildings housing the Kent Battle of Britain Museum. The housing beyond is built across the flying field. To the right of the tender building is a partly buried bulk aviation fuel store, this intended to provide protection during an attack. This last remaining part of the technical site is the focus of an application for further housing (June 2018). 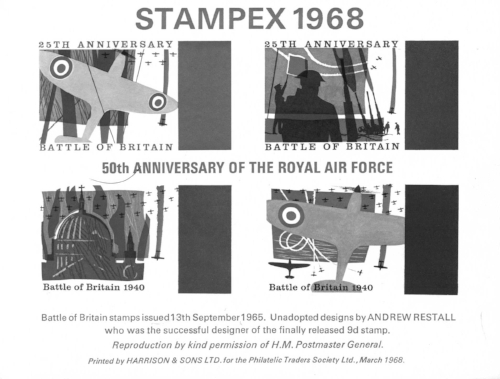 An alternative proposal for the 1965 Battle of Britain Royal Mail stamp issue. The RAF Museum’s Battle of Britain Hall layout when it first opened in 1978. A German comic-style book about the Battle, published in 1976. Film poster for the 2001 released Czech film about the Battle.